Go see Chris Ofili: Night and Day at the New Museum as soon as you can, because it will give you ample time to revisit the stunning show before it closes on January 25. You are probably familiar with his "elephant dung" series largely from the late '90s—full of delight, trippy patterns, and cartoon-like figures. One of them—The Holy Virgin Mary (1996)—was made a martyr-icon by Mayor Giuliani in one of the great culture war episodes of recent years (the events are retold in the companion catalogue). A strong selection of this period occupies the second floor of the exhibition, curated by Massimiliano Gioni, Gary Carrion-Murayari, and Margot Norton. The candy-colored series bursts with life, flesh, and adolescent star doodles; dung balls serve as pedestal feet and sculptural nodes. The Afro series, from the early 2000s, are painted in red, green, and black, and are suffused with mysterious romance and vitality. of wildly colorful canvases hung on a lavender floral background. Many of these paintings (primarily in classic rectangular proportions of approximately 120" x 80") are from the Ovid series, painted around 2010 while he was working on a two-year commission from London's National Gallery in response to Titian's Metamorphosis series, inspired by the Ovid poem. Many titles are hyphenates—Ovid-Destiny, -Desire, -Actaeon. Even without the references, these paintings, of effusive yellows, violets, and greens deserve to be carefully looked at. Several evoke the interior compositions of Matisse, with tension strung between foreground and background. The verticality of the canvases is underscored by depicting one or two figures, a geological cleave, or splitting the rectangle with the floor taking half, and the wall the rest, as in Ovid-Desire (2011—12). Ofili applies layer upon layer, so that even fields that seem solid can, upon further examination, reveal subtleties of shadowy patterns. He frequently adds elements of relief, be they blobs or dung balls or simply bulked up sheafs of paint. As you enter the main third floor gallery, you encounter what seems to be a group of black paintings. After you've allowed your eyes to adjust, you notice subtle variations in what are really inky blues. Some appear reddish, some violet, some have a sheen. Shapes emerge—figures, animals, foliage. It evokes being outside in the dark, with no artificial lights on. Everything takes on a sinister feel, especially when a lynched man becomes clear. 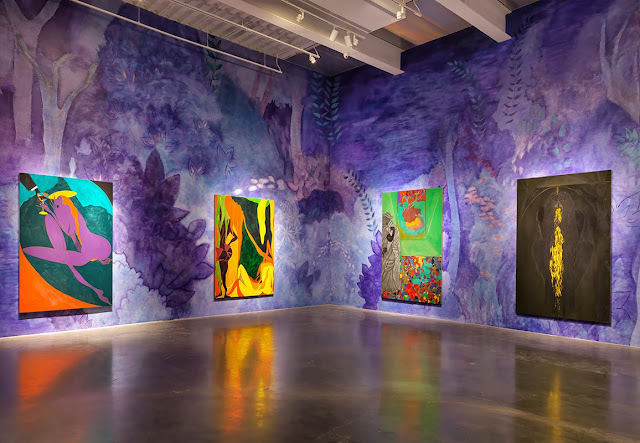 Ofili has a home in Trinidad, and he noted in a fascinating New Yorker profile: “I had found that if you put silver underneath blue, the blue sits back, like night, or glows like moonlight.” He uses ultramarine, Prussian, and cobalt blues that read like feelings as much as hues. The dark, foreboding gallery becomes, in the passage of a short amount of time, a place you want to linger in to absorb the depth and intricacies of the work. 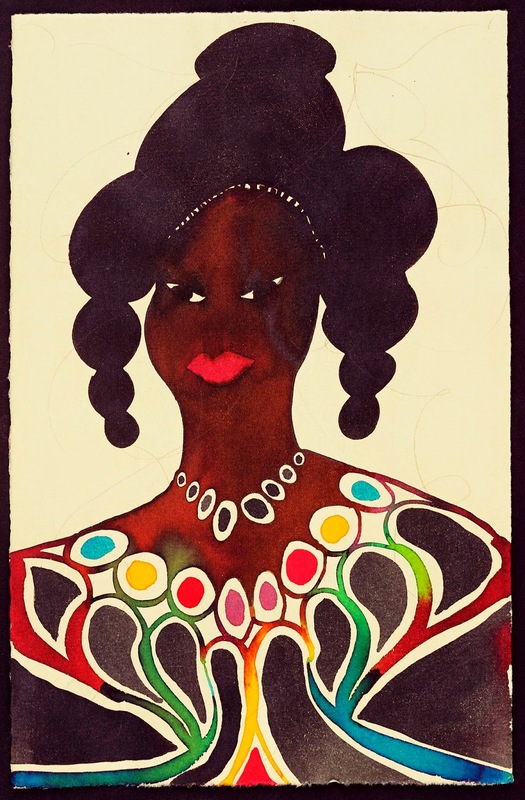 Several sculptures are on view, as well as suites of drawings—the Afro Margin series of abstract, black and white drawings, and Afro Muses, an engaging group of cameo watercolor portraits with washy gem tone clothes. The exhibition fills the New Museum to bursting, perhaps the best use of its new building since it opened. 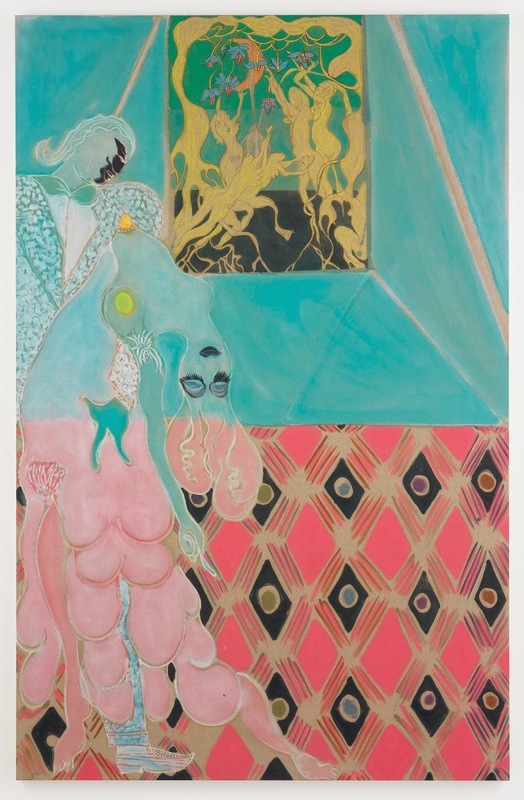 And Ofili's oeuvre connects the present with the history of art, infusing it with a life we had perhaps forgotten.